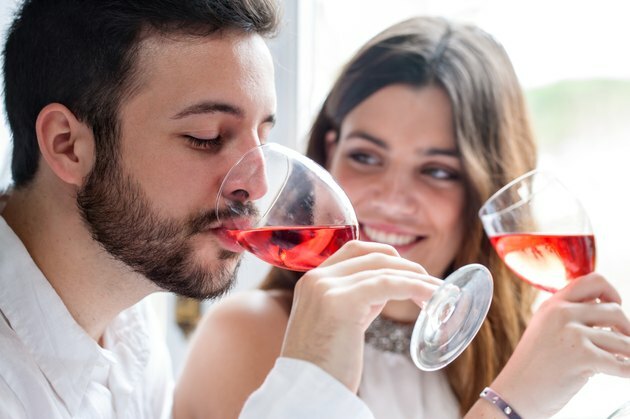 How Many Calories in Rose Wine? As a chilled wine, rose is a popular choice. Those who are monitoring their calorie intake in an effort to reach or maintain a healthy body fat percentage should understand how drinking wine will affect their total calorie intake. The number of calories in a bottle of rose wine varies amongst wine labels. It depends on the percentage of alcohol, which changes depending on how long the winemaker decides to ferment the wine. According to Wine Spectator, an average bottle of red table wine has 625 calories. The Healthy Weight Forum states that a bottle of rose wine, because it's a lighter wine and typically not as high a percentage of alcohol has about 500 calories per bottle. There are typically five glasses of wine per 750 mL bottle, which means that each glass in a 500-calorie bottle is 100 calories. Healthy Weight Forum: How many calories are there in wine?